The topic of vaping is controversial. However, one thing is for sure: as vaping is becoming a trendy habit, more and more young users start vaping. Some users vape nicotine or marijuana, which is highly addicting. At the same time, vaping creates a mental habit of vaping every 30 minutes. A definite indicator of vaping addiction is withdrawal. Vaping Addiction: Are Social Trends Addictive? Vaping has become a trendy habit, which is also addictive. After the vaping boom on the market in 2008, vaping has gained a lot of popularity among people. From teens to individuals who are trying to quit smoking, the number of people who vape keeps increasing. According to data presented by Euromonitor International, around 20.8 million people vape across the globe, with 43.2% of all users located in the U.S.
E-pens, vaporizers, e-cigs, e-pipes – the range of electronic nicotine delivery systems is impressive. What’s more, you can get a new kit or replace your old one in no time. From atomizers and inhalers to a wide variety of e-liquids and flavors, vape shops and websites have it all. In fact, there are more than 400 brands available. Forums and clubs promote vaping, and all this social pressure and positive image contribute to vaping addiction. One of the reasons that have led to the belief that vaping is less harmful is the lack of toxins, such as tar and other chemicals. 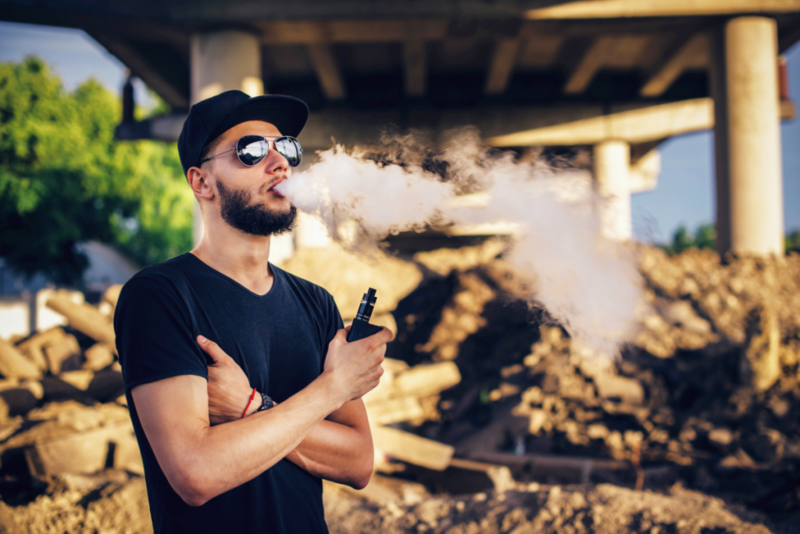 However, a recent study conducted by the John Hopkins Boomerang School of Public Health showed that e-liquids also contain toxic ingredients and may have adverse effects on the user. Although it’s true that vaping may help a person reduce their nicotine intake, vapes are not a FDA-approved quit aid. Why? Simply because some vapes contain nicotine. Thus, vaping becomes addictive. Nicotine is among the most addictive substances and, in fact, the nicotine in e-liquids is quickly absorbed into the bloodstream. As a consequence, nicotine stimulates the release of adrenaline and dopamine. All this affects the paths in the brain responsible for pleasure and reward and leads to nicotine use over and over again. According to the study, nicotine addiction starts during the first few years of smoking. For most people, this period is reported in childhood or early adolescent: 89% of daily smokers tried their first cigarette by or at age 18, and 71% people who have ever smoked daily started by age 18. Research suggests that vaping addiction puts users at risk for addiction to other substances. In fact, figures show that 30.7% of teens who vape started smoking within six months, compared to 8.1% of non-smokers. When quitting nicotine-based products or therapy like vaping, nicotine withdrawal can be a concern. Try to wean off of the nicotine by gradually lowering the intake or by vaping lower nicotine strength juices. Marijuana users have come up with some creative techniques. From hookahs to bongs, the rates of marijuana use are increasing. In fact, a study showed that one in five people who vape have used their vaporizer to get high on marijuana, which makes vaping highly addictive. Contrary to popular belief, marijuana addiction is not a myth. In fact, more than 360,000 people on marijuana were admitted to treatment for addiction, according to data presented by the Substance Abuse and Mental Health Services Administration in 2010. Vaping gives users the chance to get high without combustion. Although vaporizers spare the respiratory system, marijuana may still affect the cognitive functioning and brain structure of the user. For teens, these effects lead to poor concentration and high dropout rates. When it comes to addictive behavior, it’s the psychological dependency that’s harder to overcome. Conditioned behaviors and learned models change the reasoning of the user in a way that prevents him or her from quitting. Vaping is addictive as it’s a habit, which can be reinforced by many social stimuli. As mentioned earlier, vaping is trendy, so vapers would vape in restaurants, cafes or train stations. If smoking a cigarette is a one-go act, vapers would have a few puffs every 30 minutes. Even vapers that use 0 nicotine juices can form an addiction to vaping that is psychological rather than physiological. There are some ways to beat psychological addictions, so if your vaping is causing you problems in your life, then check out this article on how to beat it. What’s more, manufacturers produce more and more flavors, trying to target young people. Thus, according to data, only in 2012, more than 1.78 million students (6-12 grade) have tried vaping. In addition, second-hand vape can be dangerous due to the aerosol in the vaporizers and in 2016, the U.S. Surgeon General claimed that vaping is a major health concern. To sum up, vaping and its addictive properties raise controversial debates among researches and users. However, one thing is for sure: if you want to stop vaping, there are many treatment options available near you. Is there a website for this about “Can Vaping cause diseases? i’m planning to start vaping and i just wanna educate myself on the dangers, but i just wanna be sure that if i try it JUST ONCE will i get addicted? Will vaping turn you gay? Will vaping without nicotine or marijuana be addictive? Will second hand vaping impact a child in the same room? I have smoked for 40+ years, recently I went to lunch with a client who owns a vape shop. My client talked me into vaping, but then proceeded to tell me she vaped on a plane?!?! As a cigarette smoker for 40+ years, I have never thought about smoking on a plane. I am now worried about heavier addiction.